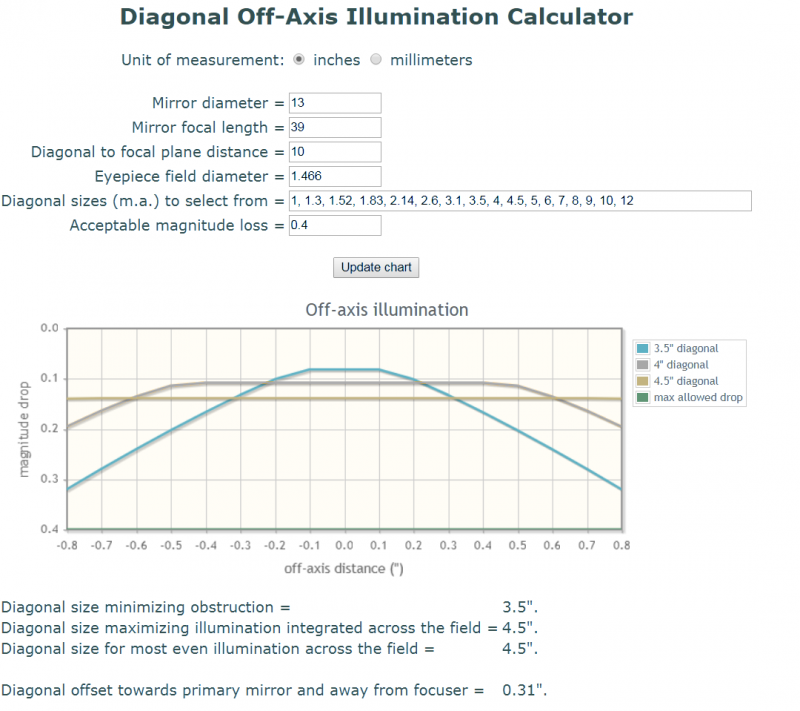 Mel Bartel's terrific "Diagonal Off-Axis Illumination Calculator" calculates the illuminated field for a given EP field stop, using the mirror diameter, focal length, intercept distance and diagonal diameter. But what is the proper way to incorporate the effect of a coma corrector that magnifies 6% or 15%? Usually people think of it as "increasing the focal ratio", as if it made the focal length greater, but really it doesn't, it is a modification of the behavior of the glass assembly at the focuser. So my thinking is that it is the field stop of the EP you are using that should be reduced to model the effect correctly. 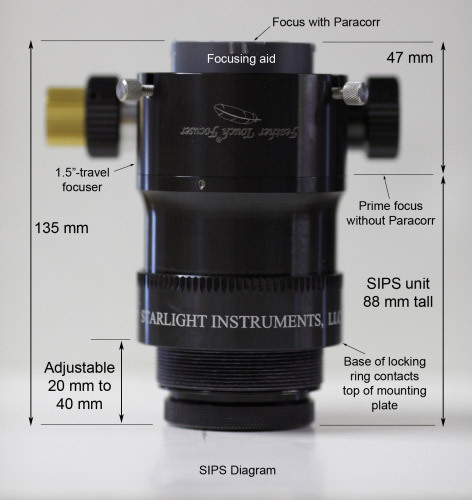 Yes, you only want to reduce the effective field stop diameter for you favorite eyepiece. The focal ratio of the light cone at the secondary mirror is not changed by the coma corrector. A Paracore essentially shrinks the field stop, so the cone moves less on the diagonal. You get more illumination on the edge, just like you would an eyepiece whose field stop is about 15% less. Edited by stargazer193857, 21 March 2019 - 03:02 PM. This is from an F/3 13" scope. You can see that the secondary is just barely bigger than the central field. You can also see that the P2 will vignette the outer rays even if the secondary was significantly larger. To "simulate" the optical effect of the P2, draw the original rays all the way to the primary focal plane. place this paracorr focal plane 57mm farther away from the primary focal plane. If I understand correctly, there are still more rays that could be getting into the P2 which you have omitted by not going larger on the diagonal mirror (green region I drew)? The diagonal appears sized to give 100% illumination only at the very center? I agree there is some diagonal size where P2 vignettes, but you are not there yet. For the calculator, ignore the coma corrector completely. It shouldn't affect the size of the secondary chosen. Nor does it change the field stop diameter of the eyepiece. Then, when figuring out exit pupil and magnification for a given eyepiece, THEN you incorporate the lengthening of the focal length by the coma corrector. It's the same as a barlow, in that the coma corrector doesn't REALLY change the f/ratio of the scope, merely changes the angles of the rays entering the eyepiece. So it affects how much focal plane of the scope is seen by the field stop diameter in the eyepiece. so the secondary could be as small as possible. And finally, the fall off due to vignetting is very slow at F/3. Edited by MitchAlsup, 22 March 2019 - 05:27 PM. Of course it does not really change field stop. The reduction in field stop is fictitious and addresses a limitation of the calculator which has no CC selection option (rather odd, given how much Mel is into fast Dobs with CCs). 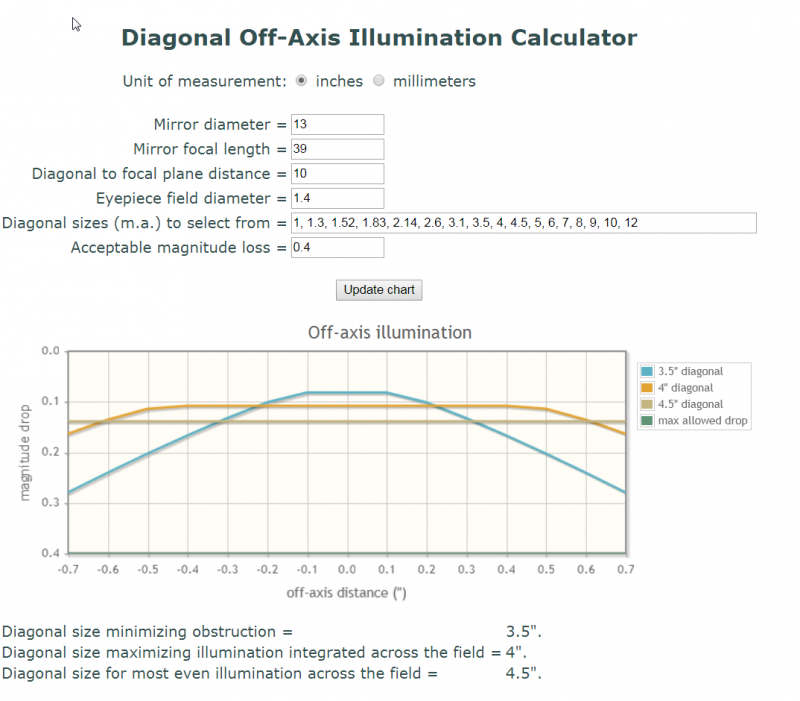 If you don't make any adjustment to field illumination displayed by the calculator is wrong. As far as I can tell the most suitable adjustment is to artificially reduce the field stop, as the CC is narrowing the FOV in a manner similar to a smaller field stop. I would not be surprised to learn that this is a rough adjustment for the calculator, and not a precise one, but I have not seen anyone suggest a better one. The front end of the Paracorr surely vignettes a large light cone, just like the secondary. the entirety of the light cone from that side of the field. the field stop of the eyepiece as if the Paracorr were not there. If that leads to a 35% secondary, it leads to a 35% secondary. If one is into 20% secondary sizes, either pick a much longer f/ratio or a much larger scope. Either way, the secondary size will go down. But it's like the people on the imaging forums who complain the secondaries on their 6" f/4 scopes are 35.7% and they're still getting vignetting in their images. One cannot escape the physics of it. Personally, were I building a 13" f/3 telescope, I'd use a 4" secondary (30.8%, but 3.8" in the holder) and just enjoy the views. A 13" f/3 isn't a planetary-specific telescope, for heaven's sake. Edited by Starman1, 22 March 2019 - 07:08 PM. the field stop of the eyepiece as if the Paracorr were not there.. Yes, although the field stop is the "prime focus without ParaCorr" (see below) and SFAIK with Mel's calculator all you have to do is include the 47mm backfocus of the PII to arrive at the working distance to the original focal plane from the diagonal. This is why there's no "accommodation" for the coma corrector in the calculator, as one isn't needed. The system is set up with the (new) FP brought to focus at the (larger) distance and the calculation proceeds as if the corrector wasn't there. For smaller mirrors the hit for speed on the secondary size is a bit extreme. But if I run Mel's calculator with minimal spacing (PII just touches the parallel rays), it's 135-47 = 88mm from the base of the unit to the focal plane (at infinity) so for a 13" f/3 that's 165+88 = 253mm. It says I can use a 3.5" diagonal...same size I came up with for a 14.7 f/3.3 mirror as well. Edited by mark cowan, 22 March 2019 - 08:03 PM. 1.25" clearance from mirror to base of focuser(includes focuser board). 3" from base of focuser to focal plane. I don't really see how it could be shorter than that. It's longer than that on my 12.5". Remember that a secondary loses perhaps 0.2" of size in a holder that goes all the way around and it is the exposed surface used in the calculator. 3.8" would be ideal, but that means a 4" secondary. ...So my thinking is that it is the field stop of the EP you are using that should be reduced to model the effect correctly. A Newtonian with a "permanent" coma corrector is, for all practical purposes, a catadioptric system. The light bundle up to the Paracorr field lens is "Newtonian" in nature, and beyond the field lens, it's corrective glass, culminating at the Paracorr focus. To model the field illumination at the Paracorr field lens, I would suggest using the distance from the primary mirror to the field lens as the focal length, and the distance from the secondary mirror to the field lens as the intercept distance, the goal being to illuminate the field lens. I don't really see how it could be shorter than that. Because the base of the SIPS (talking about this implementation only) pokes down to the parallel entrance pupil for the mirror. Whatever is required to get it there in terms of focuser positioning. Small and fast is already a trade off for diagonal size and the minor obstruction by the body of the SIPS of one area of the off-axis rays is no big additional penalty. This is exactly the sort of feedback I was looking for, thanks. But something seems missing since there is no consideration of the coma corrector magnification effect. Visual coma correctors do magnify images to varying degrees, 1.06X, 1.10X and 1.15X are all on the market. It seems like this should need to be taken into account. It's insignificant for the delta of the focal plane. I.e., if the focal plane at 39" is 1.4" diameter (the EP field diameter) than after you apply the 1.15x Barlow (for PII) the focal plane 47mm (1.85") is proportionally smaller by 39/(39+1.85) = 0.955 , which makes it 1.34". If you adjust the enrtry in the calculator to make the EP field diameter 1.466" (the inverse) to yield 1.4" at the further distance, the diagram changes almost not at all. My 2" travel Moonlight focuser barrel is 3.35" long (P2 is only about 3.0"), so that limits how close I could place it without penetrating the parallel rays to the primary (it does vignette some of the off axis rays, but I figured likely not noticeable in wide field views). I had to move the focuser board out away from the UTA shell to move the Moonlight out enough to achieve this. No more than you would modify the construction of a scope because you are using a Barlow lens. The magnification factor should not figure in to the design or secondary size. The magnification factor isn't significant (with regard to the secondary mirror size)--the reduction of the intercept distance (to the Paracorr field lens) is significant (about 90mm from the SIPS diagram above). to figure the secondary size, why wouldn't the Paracorr require an INCREASE in secondary size? But that is moot, because I argue that the presence of the Paracorr does not change the size of the secondary chosen, any more than a barlow in the light path does. Yes, the Paracorr's bottom lens is closer to the secondary. So? or absence shouldn't have an effect on secondary size. The key reason I am interested in understanding this issue as precisely as I can is that I am planning a 20" F/3.7 Newtonian optimized for richest field, will be using the ES100 25mm (41mm field stop) and a Paracorr, for the widest field views, and need to decide on the secondary. There is an enormous price jump, and precision limitation from going from a 4" diagonal, the largest standard size, to anything larger, even 4.25", which must be special ordered with long lead times, so I am trying to determine whether 4" will suffice. According to the very informative TelescopeOptics website anything less than 0.075 wave PV (that is, 1/13 wave) is diffraction limited, so I figure a 1/14 wave 4" (from Astrosystems, say) is effectively perfect. But for a 4.25" mirror they only offer it at 1/10 wave, and the cost is twice as much. As a side note, in a scope of this FR, is there really any benefit of the Paracorr II over the original? For visual use It seems clear to me from the figure at the link I posted that you set it up so prime focus is at least 14mm (0.55") above the racked in focuser position plus some margin, so say 0.8" to 1" to allow for the required in-focus with the P2. The field stop position on the ES25 100 is -8mm so it could be used without the P2 with the above setup, so could an ES20 100 with -15.2mm FS position. As for accounting for the barlow effect, I think you just ignore that except when estimating the magnification in which case I just multiply the magnification without P2 by 1.15 since magnification is primary f.l./eyepiece f.l. which with P2 becomes 1.15*primary f.l./eyepiece f.l. Are you planning to use it for AP so want to know the exit pupil size? Seems that would be a factor of 1.15 smaller than without the P2 since magnification is also the ratio of entrance to exit pupil. In this sense it is increasing the effective focal ratio of the primary as it is the same as you would get with no P2 if the primary indeed had that FR. Am I missing something Don? Edited by tommm, 24 March 2019 - 09:59 AM. If I assume the I.D. of your UTA is 2" larger than your 20" mirror, and the bottom of a 1.45" tall Moonlight focuser is 0.5" outside that I.D., then I get 11" + 0.5" + 1.45" + 1" = 13.95" secondary to prime focus distance, using prime focus position 1" above the racked in focuser. Using Mel's calculator with FS diameter = 41mm (1.61") for the ES25 100 shows a 4" secondary is fine for visual use, but you might want a 4.5" for AP and 5" for 100% fully illuminated fov. A ray trace will show if you get vignetting by the focuser barrel or P2 with this configuration. Not a lot you can do if that is the case, other than squeeze the 1" parameter down a bit and hope you can reach focus, or use a focuser board thinner than the nominal 0.5", or go to a SIPS type mounting. I think Mitch just made his own permanent fixture for the P2 in place of a SIPS. Notice I used the unadulterated 41mm exit pupil of the ES25 100 in Mel's calculator, which is what I think Don meant when he said to just ignore the P2 when setting it up. All that Televue says is place prime focus at least 14mm above the shoulder of the P2. That just figures into the secondary to prime focus distance in the calculator. Edited by tommm, 23 March 2019 - 12:25 PM. ...You guys keep arguing it does, and I agree it changes the vignetting in the system (in the same way a long focuser drawtube would), but its presence or absence shouldn't have an effect on secondary size. I disagree. Like the secondary mirror (which behaves, for all practical purposes, as a field stop), the Paracorr field lens is also a field stop. In this respect, a larger secondary mirror is already being stopped even if the Paracorr lenses are removed. Using the Bartels calculator, the eyepiece field diameter represents the illuminated diameter represented in the off-axis illumination chart. If the Paracorr field lens is illuminated 100-percent, the internal Paracorr lenses are responsible for the illumination profile at the eyepiece. I don't understand these numbers. If "intercept" is the distance from the diagonal center (optical tube axis) to the FP as in my first example, the 10" is where the original FP of the f/3 lies. With that set the SIPS bottom barrel just kissed the parallel rays for the mirror. In example 2 "intercept" is moved in by 3.5", which puts all kinds of obstruction into the light path... Same for example 3. And both are showing faster mirrors than the design I was discussing.